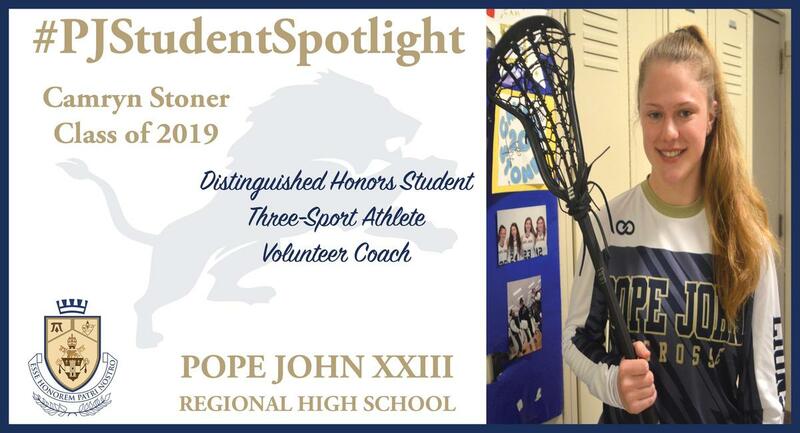 We at Pope John XXIII Regional High School want to share with you a new series called “Pope John Student Spotlight” in which we recognize our students’ talents and achievements! Today, we want to showcase Camryn Stoner! 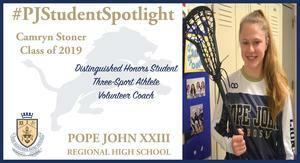 Stoner is a senior who has demonstrated her great abilities while at Pope John. She has earned Distinguished Honors in the classroom while taking courses such as Pre-Calculus, Forensic Science, History of Great Trials and Graphic Design. Stoner is also a three-sport athlete, serving as captain for lacrosse, soccer and basketball. In addition, Stoner has volunteered as a coach for youth lacrosse for Building Blocks Lacrosse and youth basketball for Reverend George A. Brown Memorial School. Stoner will be attending Marist College, where she will continue her academic and lacrosse careers.